know that Morning Glories have been on my mind! That archway is really lovely. The blue color of the Morning Glories is a real pretty true blue also. How beautiful, Liz! You truly live in a paradise!! That was nice, humming along as I enjoyed one of the true blue flowers we can grow. I could hear that sweet song in my head while I looked at your beautiful pics. Those lovely blooms make my heart sing. You made all of us sing, it seems! Your morning glories are one of my favorites, as if you couldn't guess. The vines on mine already have started turning brown because of our unusually dry conditions and the blooms are dwindling. I guess I'll have to be content with enjoying yours through these beautiful pictures--thank you! Your morning glories are so beautiful and I like your song, too! I planted morning glories this spring and have some blooming, but not as pretty as yours! Mr. bunny came along and ate quite a few vines of mine! My sis-in-law once visited me from Oregon and when she saw mine she said they are weeds in Oregon! If they are I sure love them! Have a lovely weekend. 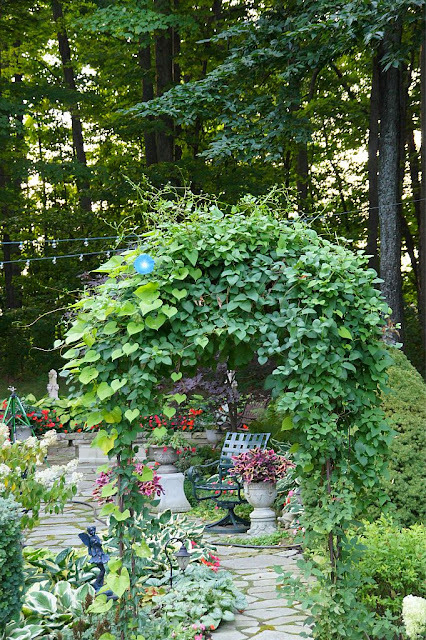 Liz,your garden is stunning,and so beautiful backing onto that lovely forest of trees. Morning glory is so beautiful. We can't put it in her as it grows out of control and takes over everything in its path. lovely blooms. Your morning glories are so pretty. What a delightful post, Liz. This is one of my favorite songs. My hubby and I do a cabaret act, and we have a focus on songs from classic Broadway, Hollywood and Tin Pan Alley, and this is one that my sweetie sings as he plays piano--it's a gorgeous one! I also love Heavenly Blue morning glory--yours are so vibrant and pretty. Thank you so much for stopping by my blog and leaving a sweet comment--I appreciate it!